1. Wine and …. – help the couple set-up or complete a wine cabinet and party. Maybe the couple will invite you over for cocktails. 2. Tea Party – gifts would include items for coffee, tea even cocoa. 3. Around the World – for the couple that loves to travel. Have foods from places they have visited or would like to visit. You could even have each person bring a recipe from a pre-selected region. 4. The great outdoors – for the couple that loves to camp, hike or just be outside. You could get them items for a picnic basket, coordinate clothing, etc. 5. How does your garden grow – for the couple that loves to grow their own fruits and vegetables. 7. Entertainment – This would be for the couple that likes to entertain guests – board games, puzzles, DVD’s, CD’s, I-tunes credit, museum certificates, etc. 8. Room of the house – Guests are given a room of the house to buy a gift for. What a great way to furnish the couples new home. 9. Hours of the day – Guests are given an hour of the day to buy gifts for. This could really be fun and extremely creative. 10. Months of the year – Guests are given a month of the year to buy a gift. 11. Letters of the alphabet – Guests are given a letter of the alphabet to buy a gift. This could be paired with the other themes also. 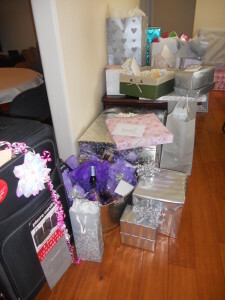 12 Bed and breakfast – Guests are asked to provide a gift for the kitchen or bedroom. Let’s face it, during the first couple of years these are the two rooms that get the most use. 13. Lingerie – I think this is self explanatory. 14. Spa shower – This theme is to indulge and pamper senses.One thing to remember – with all the themes the idea is for the gift to be for both the bride and the groom. I know it is a bridal shower, however it is a party to celebrate the wedding of the bride and groom. If they weren’t getting married, there wouldn’t even be a bridal shower.